When Super Mario Bros. hit theaters in 1993, it ushered in something new -- the movie based on a video game. In the two decades since, we have been inundated with pixellated characters who have been brought to the big-screen...and many of these movies have not been very good. Most of the games in question had little to no story to begin with, so the filmmakers were simply winging it and throwing bad ideas at the screen. (Of course, even when the game did have a complete story, such as with Resident Evil, those involved in the movie still messed things up.) Now, a new era is being ushered in as we get a movie based on an app. Will The Angry Birds Movie have any substance whatsoever? The Angry Birds Movie takes place on Bird Island, a place of peace and tranquility. Here we meet Red (voiced by Jason Sudeikis), a party clown with a terrible temper and a cynical attitude. After having a meltdown at a party, Red is hauled into court and sentenced to anger management. There, he meets Chuck (voiced by Josh Gad), a yellow bird who is known to speed and steal, Bomb (voiced by Danny McBride), a black bird who literally explodes at times, and Terence (voiced by Sean Penn), a huge bird who doesn't talk. As one would imagine, Red doesn't do well here and he continues to be ostracized by the town. Things change when a boat suddenly lands on-shore, revealing a pig named Leonard (voiced by Bill Hader). Leonard claims that he is an explorer and that he comes in peace. Red is immediately wary of this stranger who wins over the other birds. When Red realizes that his suspicions are correct, he recruits his fellow anger management birds to help him defeat these intruders. If you've played Angry Birds, or one of its many spin-offs, then you know the basic premise -- The pigs have stolen the birds' eggs and the birds hurl themselves at the pigs structures in order to retrieve them. Even for a video game, this is a pretty flimsy plot structure. So, it's surprising that The Angry Birds Movie hasn't added much to this in order to flesh out a feature film. In many ways, the basic plot remains the same. Things are expanded somewhat with the character development, but not much. Save for the opening scene, Red being a clown is never mentioned again, and we never learn why a misanthrope would have such a job. We know that he's very cynical, so I guess that's all that matters. Chuck is quite the opposite, as he has too many personality traits and he's nearly impossible to nail down. Bomb is big and somewhat slow and explodes. What else do you need to know? Everyone else on Bird Island comes across like a variation on Whoville, as they are all ignorant and happy. In Leonard, we get a pig who comes across as a used car salesman, and only wants to distract the birds while he and his cohorts steal the eggs. The real departure/expansion from the game is the Mighty Eagle character, who is voiced by Peter Dinklage. In the game, Mighty Eagle is a power-up which is used to clear difficult levels. Here, he's a sort of mythical Superman, who Red enlists to help. These characters are placed into a story which, again, adds little to the plot of the game. We meet the birds, the pigs arrive, the pigs steal the eggs, and the birds seek revenge using a slingshot to infiltrate and damage the pigs' buildings. We know that this last item is going to arrive at some point, so it's not the revelation which the movie hopes that it is once Red is first flung into a structure. Onto this flimsy story, the filmmakers have crafted a decidedly hyperkinetic movie in which things are constantly happening, especially during the third act. I'm sure that this went far in keeping youngsters involved in the movie, but I would have traded some of this action for a more clever approach. Based on the trailers, I expected the movie to be much smarter, but save for a few jokes here and there, the subject matter isn't as subversive as I'd hoped. And what was up with the country song? The biggest question surrounding The Angry Birds Movie is the film's timing. The first Angry Birds game was released in 2009 and it would appear that the franchise peaked in popularity a few years after that. The combination of a late-arrival and an oddly crafted film doesn't bode well for The Angry Birds Movie. The movie's saving grace is the animation, which is gorgeous. The color palette here is amazing and the detail used in the characters and backgrounds is truly impressive. Still, that, and a few good jokes don't change the fact that this is decidedly mediocre, but isn't that what we should have expected from a movie based on an app? 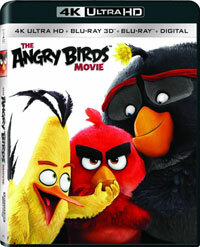 The Angry Birds Movie raises some eyebrows on Blu-ray Disc courtesy of Sony Pictures Home Entertainment. The film has been letterboxed at 1.85:1 and the Disc contains an AVC 1080p HD transfer which runs at an average of 25 Mbps. The picture is very sharp and clear, showing no grain whatsoever and no defects from the source materials. The colors look fantastic and the image is never overly dark or bright. The level of detail is very impressive and the picture has a nice amount of depth. The Disc carries a DTS-HD MA 7.1 audio track which runs at 48 kHz and an average of 2.6 Mbps. The track provides clear dialogue and sound effects. This is a very active track, as we are consistently treated to stereo, surround, and subwoofer action from the various bird and pig activities. From the sounds which accompany Chuck's speed to the explosions of the finale, the track provides detailed effects in which we can pick out individual sounds. This set also includes a Blu-ray 3D, where the film has been letterboxed at 1.85:1 and the Disc contains an AVC 1080p transfer which runs at an average of 25/15 Mbps. The 3D is very impressive here, as there is a very clear delineation between the characters in the foreground and the backgrounds. This depth really adds to the animation and the colors remain stable here, which can often be a problem with 3D. Second only to The Peanuts Movie, this is great 3D animation. The audio presentation here is the same as the one described above. In addition, we also get a 4K Ultra HD version of the film, where the transfer runs at 2160p. I've been on the fence about 4K thus far, but I must say that The Angry Birds Movie looks amazing. While the regular Blu-ray looks very good, this version truly brings out all of the details in the animation, allowing us to see each individual feather and the true scope of the landscape. In addition, the colors are truly mind-blowing. The depth, while not 3D, also looks amazing. If you are looking for a 4K demo disc, this might be it. The Disc offers a Dolby TrueHD 7.1 audio track which provides truly powerful audio as well. Not unlike the DTS track, we get an array of surround and stereo effects here and the track really comes to life during the finale. The Angry Birds Movie Blu-ray Disc contains several extras. "Hatchlings!" (10 minutes) is five animated shorts which feature "The Hatchlings", which are baby Angry Birds. (Who look like The Chubbchubbs for those who remember those shorts.) The Disc offers six DELETED SCENES which run about 7 minutes. These are all brief and surprisingly fully-animated. "Dance Along with the Birds and Pigs" (4 minutes) is a dance-instruction video. I'm not kidding. "Crafty Birds" (5 minutes) shows us how to make birds out of household items. "Creating the Real World of Angry Birds" (8 minutes) is a brief "making of" featurette which takes us into the animation studio to see how the characters and locations were designed and created. "Bubbles and Hal" (2 minutes) is another animated short with the boomerang bird and the puffer-fish bird. "Meet the Birds" (10 minutes) shows us how the characters went from the game to the screen, exploring each character and allowing comments from the voice actors. "Meet the Pigs" (5 minutes) offers similar treatment to the film's villains. We get the MUSIC VIDEO for the song "Friends" by Blake Shelton. The musical focus continues with "Making Music with Composer Heitor Pereira" (11 minutes), a six-part look at the film's music. "In-Theater Policy Trailers" (3 minutes) offers three interstitials which were show in theaters. Finally, we have a PHOTO GALLERY.